If you’re a student looking to land an internship or your first full-time job, you probably know that companies are looking for people with data skills. But they’re not just looking for any data talent—they’re specifically looking for people who know how to use Tableau. In fact, Tableau was recently listed as the third fastest growing technical skill in demand. The first step to being successful with Tableau is learning the tool itself. Recent grad Matt Atherton states, “Start with tutorial videos - first the Getting Started video on Tableau’s website. When you’re watching these, think about how to visualize your own data”. This short 25-minute video will provide you with an overview of Tableau Desktop from start—connecting to data—to finish—sharing your completed visualizations. Once you’ve gotten the lay of the land, you can dive deeper into specific functionality with the Starter Kits and on-demand training videos on our website. As a student, Lynda.com is also a great resource, since many schools have subscriptions that allow for free access. Search for Tableau and you’ll find hundreds of videos and courses, many created by experts in the Tableau community. Our community is part of what makes Tableau so unique. Not only is our community active on our user forums, they also create a bunch of great training content. Check out the Tableau Reference Guide created by one of our Zen Masters, Jeffrey Shaffer. Once you start learning the functionality of Tableau, the next step is finding data you want to analyze. We’ve compiled a list of free data resources to help. That’s not all. Makeover Monday, currently run by Tableau Social Ambassador Eva Murray and Tableau Zen Master Andy Kriebel, is a great way to start honing your data viz skills and get involved in a broader conversation about and with data. Each week a link to a chart and its data is posted online. Your task is to rework the chart and then share it on Twitter. This is a great way to engage with the Tableau community and get feedback on your work. And if that’s not enough, take your Tableau skills to the next level with Workout Wednesday. Once you’ve started created your own vizzes, don’t forget to publish them to your Tableau Public profile to start your data portfolio (learn how to do that here). A great example of this is Corey Jones’s profile. He started his data portfolio while he was a student at Saint Joseph’s University. Once you’ve published a few vizzes, you can add your Public profile link to your resume and LinkedIn profile to showcase your skills to future employers and get a leg up on the competition. I wish you the best of luck on the start of your Tableau journey and can’t wait to see what you create. 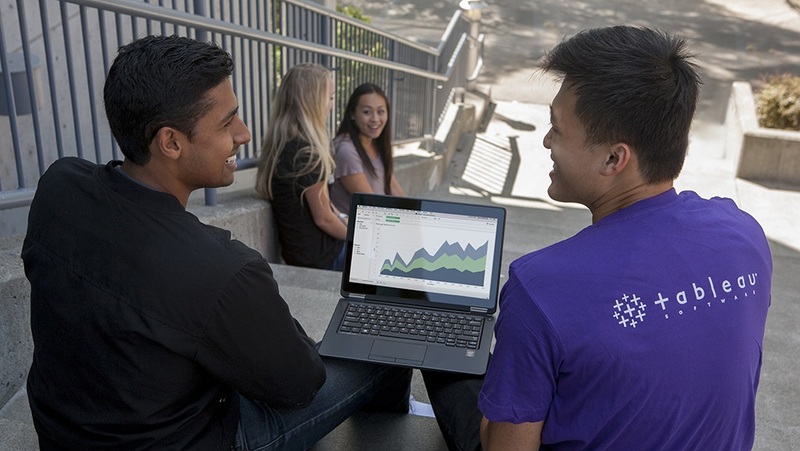 Don’t forget to enter your viz into our student contest for a chance to win Tableau swag. If you don’t yet have a free student license, request yours today! may I have Student version of tableau, sounds interesting to explore more. I am a student about data management.